Major tax reforms went into effect in 2018, affecting individuals as well as their businesses. 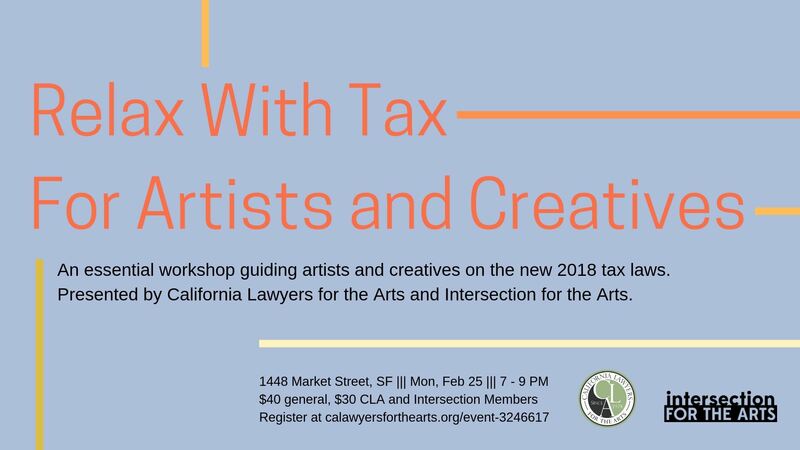 California Lawyers for the Arts and Intersection for the Arts invite artists and creatives of all disciplines to join us for a workshop on the essentials of income tax for individual artists. Topics will include record keeping, IRS form 1040, Schedule C, self-employment schedules, itemized deductions, hobby losses, and home offices. Thomas M. Andres, J.D., C.P.A. represents numerous creative clients, including filmmakers, musicians, artists and writers. He has practiced for over forty years in accounting and taxation, with an emphasis on the financial concerns of individuals. He graduated from the University of Notre Dame with a concentration in finance, and earned his law degree from Golden Gate University. The Art of Deduction manual is included in the cost of admission. An ADA elevator is located at 39 Fell Street, San Francisco. You'll enter through Mr. Tipples, a fun jazz club, and take the elevator to the second floor.